Sunday 21st October 2007 - Iraqi refugees sat together with Israeli ex-pats. 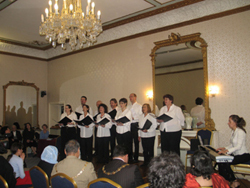 Iranian grandparents were alongside Palestinians and Israelis as everybody listened appreciatively to ‘Shir la Shalom’ being sung by the Topaz Jewish Choir. A poetry recital given by Fathieh Saudi and Kerry Fleur-Schleiter followed, as did the Muslim call to prayer. Musicians, peace activists and dignitaries of differing faith groups were mixed together for an evening that had been inspired by an Israeli living in London, Yael Lindenboim, and hosted by the Universal Peace Federation at its premises in Lancaster Gate. The Mayor of the London Borough of Waltham Forest, Cllr Liquat Ali (right in photo) and the Speaker of the Borough of Hackney, Cllr Faizullah Khan, (2nd from right) both gave an account of the value of Ramadan to their lives and an Iraqi born Jewish businessman, Edwin Shuker, (3rd from right) spoke of the value Sabbath and High Holy Days. A peace activist called Hilde Rapp spoke of the commonality of all that she had heard from the other speakers. It was interesting to note that over Kosher and Halal refreshments towards the end of the evening, even joint business opportunities and projects were being openly explored by those present. A Jewish journalist quipped that that if the end result of getting Jews and Muslims together over such delicacies as rogala and samosas was that they started talking business together; then maybe there was a real hope in resolving historical differences after all. Ambassador for Peace awards were presented to former Iraqi Ambassador, Hamid L. Sharifi, Mr Mayur Premji, Kerry Fleur-Schleiter and Yael Lindenboim. Dr Raheem Khan explained the significance of the awards and encouraged all those receiving it make even greater efforts for peace. Short-listed Liberal Democrat candidate for London Mayor, Fiyaz Mughal, attended the presentation with his wife, Imam, who used to work in Haddassah hospital in Jerusalem.